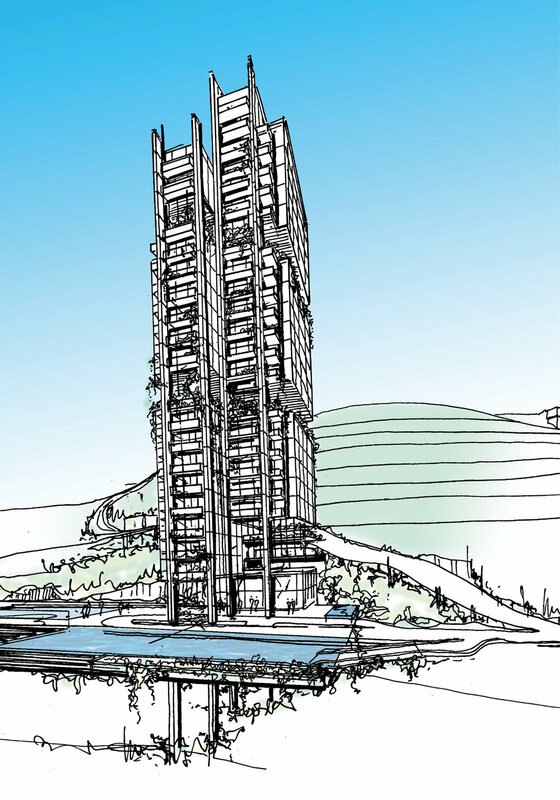 Located above the mid-levels between Magazine Gap Road and Dutch Path this tower creates 35-40 luxury apartments with priceless views over Victoria Harbour. The ground floor of the tower contains the reception and car drop off with a changing room for the cantilevered private pool for the residents. Cars are parking underneath the pool in the basement. Our clients brief was to develop a building structure which created a flexible frame, capable of inserting a range of apartment layouts and variable sizes. Single level, lateral and vertical duplex apartments typologies all had to work within the same superstructure. The tower predominantly contains two apartments per floor each between 3-5000 sq/ft. The apartments are each dual aspect and have large private terraces which enjoy the spectacular views over the bay towards Kowloon. Sky gardens have been used to form breaks in the vertical arrangement of the tower. The concept of a building which allowed infinite flexibility of accommodation, in any number of solutions is a further development of an idea which was first developed whilst Stuart was working at RSH-P, many years earlier. In that instance a concept building form was developed with the R&D department at Arup to explore the possibility of mass produced housing units which could be assembled into towers, each being tailored to the terrain and variable site conditions for a Korean client. At the time 3d printing of building components had not been invented, however the principles developed during this study were firmly embedded in this early research and this kind of technology would be ideally suited to this project with our client from Taiwan.